The Calvin cycle is an important and complicated series of biochemical reactions that take place in photosynthetic organisms and results in the fixing of carbon from carbon dioxide into organic molecules. One of the light-independent (dark) reactions used for carbon fixation, this metabolic pathway uses the energy stored in ATP and uses NADPH as a source of electrons (reduction potential), both provided during light-dependent reactions, to reduce carbon dioxide and fix it into the higher energy organic molecules. It is a "cycle" in that some of the product is recycled. The Calvin cycle takes place in the stroma of chloroplasts. It also is known as the Calvin–Benson-Bassham cycle (CBB cycle), reductive pentose phosphate cycle, or C3 cycle. The Calvin cycle is one of the most metabolic pathways on Earth. All of the carbon fixed by green plants, whereby relatively low-energy carbon dioxide molecules are converted into high-energy organic molecules, comes via this series of reactions. The coordination of this finely-tuned, complicated partway, involving several steps, a number of three- to seven-carbon molecules, a large 16-subunit enzyme, and other components, reflects on the stunning harmony found in nature. Redox reactions. The Calvin cycle, and the associated process known as photosynthesis, involve what are known as "redox reactions" or "oxidation-reduction reactions." Oxidation occurs when an atom or molecule loses an electron (with oxygen being the most common electron acceptor). Reduction occurs when an atom or molecule gains an electron. A reduced molecule or atom, with the extra electron, has a higher level of energy than an oxidized form of the atom or molecule. A redox reaction is a chemical reaction where electrons lost by one atom through oxidation are gained by another atom through reduction. Photosynthesis. The process of photosynthesis is the source of the carbon found in the organic compounds within the bodies of living organisms, as well as a means for capturing the energy from sunlight. Some of the light energy is stored in the form of adenosine triphosphate (ATP) and some of the energy is used to remove electrons from a substance such as water, with the electrons then used in the reactions to turn carbon dioxide into organic compounds. In plants, algae, and cyanobacteria, these reactions to produce organic compounds comprise the metabolic pathway known as the Calvin cycle. The overall process of photosynthesis can be described in terms of three stages: two-light dependent reactions and one light-independent reaction. The two light-dependent reactions are (1) capturing energy from sunlight; and (2) creating ATP and reducing NADP+ to NADPH. The light-independent reaction, which can take place in the presence or absence of light and is known as "carbon fixation," involves utilizing ATP and NADPH to synthesize organic molecules from carbon dioxide. Carbon fixation is part of the Calvin cycle. Calvin cycle. The Calvin cycle is a series of biochemical redox reactions that take place in the stroma of chloroplasts in photosynthetic organisms. Essentially, the light-independent Calvin cycle, also known (erroneously) as the "dark reaction" or "dark stage," uses the energy from short-lived electronically excited carriers to convert carbon dioxide and water into organic compounds (Campbell et al. 2006). It also can be described in terms of three phases: (1) carbon fixation, (2) reduction, and (3) regeneration of RuBP. Phase I: Carbon fixation. In the carbon fixation phase of the Calvin cycle, inorganic carbon in the form of carbon dioxide becomes incorporated into organic form. Essentially, carbon dioxide is reduced to provide a higher energy molecule. During this phase, a five-carbon, energy-rich sugar RuBP (ribulose 1,5-biphosphate) is produced. It is produced by reassembling two products of glycolysis: fructose 6-phosphate and glyceraldehyde 3-phosphate (G3P). After RuBP is produced, carbon dioxide reacts with RuBP to form a transient 6-carbon intermediate. This 6-carbon intermediate immediately splits into two molecules of three carbon 3-phosphoglycerate (PGA). It uses the enzyme ribulose biphosphate carboxylase oxygenase (called RuBisCo), which is a large 16-subunit enzyme. Phase II: Reduction. In the second phase, reduction, PGA is reduced to G3P (glyceraldehye 3-phosphate) using ATP and NADPH. Some G3P (which has three carbons) leaves the Calvin cycle and is converted to glucose and other sugars. Note: two molecules of G3P (the output of carbon fixation and reduction) is needed to produce a six-carbon glucose molecule. Phase III: Regeneration. While some G3P is shunted out of the Calvin cycle to produce glucose and other sugars, much of it is recycled in order to regenerate RuBP, to keep the cycle going. The enzymes in the Calvin cycle are functionally equivalent to many enzymes used in other metabolic pathways such as gluconeogenesis and the pentose phosphate pathway, but they are to be found in the chloroplast stroma instead of the cell cytoplasm, separating the reactions. They are activated in the light (which is why the name "dark reaction" is misleading), and also by products of the light-dependent reaction. These regulatory functions prevent the Calvin cycle from being respired to carbon dioxide. Energy (in the form of ATP) would be wasted in carrying out these reactions that have no net productivity. Hexose (six-carbon) sugars are not a product of the Calvin cycle. Although many texts list a product of photosynthesis as C6H12O6, this is mainly a convenience to counter the equation of respiration, where six-carbon sugars are oxidized in mitochondria. The carbohydrate products of the Calvin cycle are three-carbon sugar phosphate molecules, or "triose phosphates," namely, glyceraldehyde-3-phosphate (G3P). The Calvin cycle was discovered by Melvin Calvin, James Bassham, and Andrew Benson at the University of California, Berkeley by using the radioactive isotope carbon-14 (Bassham et al. 1950). The enzyme RuBisCO catalyses the carboxylation of ribulose-1,5-bisphosphate (RuBP), a 5-carbon compound, by carbon dioxide (giving a total of 6 carbons) in a two-step reaction (Farazdaghi 2009). The product of the first step is an enediol-enzyme complex that can capture CO2 or O2. Thus, enediol-enzyme complex is the real carboxylase/oxygenase. The CO2 that is captured by enediol in second step produces a six-carbon intermediate initially that immediately splits in half, forming two molecules of 3-phosphoglycerate, or PGA, a 3-carbon compound (also known as 3-phosphoglycerate, 3-phosphoglyceric acid, 3PGA) Campbell et al. 2008). The enzyme G3P dehydrogenase catalyses the reduction of 1,3BPGA by NADPH (which is another product of the light-dependent stage). Glyceraldehyde 3-phosphate (also G3P, GP, TP, PGAL) is produced, and the NADPH itself was oxidized and becomes NADP+. Again, two NADPH are utilized per CO2 fixed. Triose phosphate isomerase converts all of the G3P reversibly into dihydroxyacetone phosphate (DHAP), also a 3-carbon molecule. Then fixation of another CO2 generates two more G3P. F6P has two carbons removed by transketolase, giving erythrose-4-phosphate. The two carbons on transketolase are added to a G3P, giving the ketose xylulose-5-phosphate (Xu5P). E4P and a DHAP (formed from one of the G3P from the second CO2 fixation) are converted into sedoheptulose-1,7-bisphosphate (7C) by aldolase enzyme. Sedoheptulose-1,7-bisphosphatase (one of only three enzymes of the Calvin cycle that are unique to plants) cleaves sedoheptulose-1,7-bisphosphate into sedoheptulose-7-phosphate, releasing an inorganic phosphate ion into solution. Fixation of a third CO2 generates two more G3P. The ketose S7P has two carbons removed by transketolase, giving ribose-5-phosphate (R5P), and the two carbons remaining on transketolase are transferred to one of the G3P, giving another Xu5P. This leaves one G3P as the product of fixation of 3 CO2, with generation of three pentoses that can be converted to Ru5P. R5P is converted into ribulose-5-phosphate (Ru5P, RuP) by phosphopentose isomerase. Xu5P is converted into RuP by phosphopentose epimerase. Finally, phosphoribulokinase (another plant-unique enzyme of the pathway) phosphorylates RuP into RuBP, ribulose-1,5-bisphosphate, completing the Calvin cycle. This requires the input of one ATP. Thus, of 6 G3P produced, three RuBP (5C) are made, totaling 15 carbons, with only one available for subsequent conversion to hexose. This required 9 ATPs and 6 NADPH per 3 CO2. Photorespiration. 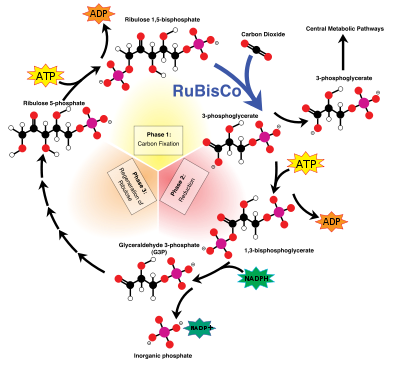 RuBisCO (ribulose bisphosphate carboxylase oxygenase) not only catalyzes the carbon fixation reaction whereby CO2 reacts with RuBP (ribulose 1,5 bisphosphate) to ultimately yield two molecules of PGA (3-phosphoglycerate), but it also catalyzes the oxidation of RuBP, whereby oxygen is incorporated into RuBP, releasing CO2 and hindering carbon fixation. This is known as photorespiration. In other words, in photorespiration, RuBisCO reacts competitively with O2 instead of CO2. The rate of photorespiration is higher at high temperatures. Photorespiration turns RuBP into 3PGA and 2-phosphoglycolate, a 2-carbon molecule that can be converted via glycolate and glyoxalate to glycine. Via the glycine cleavage system and tetrahydrofolate, two glycines are converted into serine +CO2. Serine can be converted back to 3-phosphoglycerate. Thus, only 3 of 4 carbons from two phosphoglycolates can be converted back to 3PGA. It can be seen that photorespiration has very negative consequences for the plant, because, rather than fixing CO2, this process leads to loss of CO2. C4 carbon fixation evolved to circumvent photorespiration, but can occur only in certain plants native to very warm or tropical climates, for example, corn. The immediate products of one turn of the Calvin cycle are 2 glyceraldehyde-3-phosphate (G3P) molecules, 3 ADP, and 2 NADP+ (ADP and NADP+ are regenerated in the Light-dependent reactions). Each G3P molecule is composed of 3 carbons. In order for the Calvin cycle to continue, RuBP (ribulose 1,5-bisphosphate) must be regenerated. So, 5/6 carbon from the 2 G3P molecules are used for this purpose. Therefore, there is only 1 net carbon produced to play with for each turn. To create 1 surplus, G3P requires 3 carbons, and therefore 3 turns of the Calvin cycle. To make one glucose molecule (which can be created from 2 G3P molecules) would require 6 turns of the Calvin cycle. Surplus G3P can also be used to form other carbohydrates such as starch, sucrose, and cellulose, depending on what the plant needs (Russell et al. 2010). 12 molecules of PGA (three-carbon product) become 12 molecules of G3P (three-carbon product). In the Calvin cycle for the above, 18 ATP are also used and 12 NADPH. Bassham, J. A. 2003. Mapping the carbon reduction cycle: A personal retrospective. Photosyn. Res. 76(1-3): 35–52. PMID 16228564. Bassham, J., A. Benson, and M. Calvin. 1950. The path of carbon in photosynthesis. J Biol Chem 185(2): 781–7. Retrieved July 26, 2011. Campbell, N. A., B. Williamson, and R. J. Heyden. 2006. Biology: Exploring Life. Boston, MA: Pearson Prentice Hall. ISBN 0132508826. Campbell, N. A., J. B. Reece, and E. J. Simon. 2008. Essential Biology. San Francisco, Calif.: Benjamin Cummings. ISBN 0805368426. Farazdaghi, H. 2009. Modeling the kinetics of activation and reaction of Rubisco from gas exchange. Advances in Photosynthesis and Respiration 29: 275–294. Retrieved July 27, 2011. Portis, A., and M. Parry. 2007. Discoveries in Rubisco (ribulose 1,5-bisphosphate carboxylase/oxygenase): A historical perspective. Photosynthesis Research 94(1): 121–143. PMID 17665149. Retrieved July 27, 2011. Raven, P. H., G. B. Johnson, J. B. Losos, K. A. Mason, and S. R. Singer. 2008. Biology, 8th edition. Boston: McGraw Hill. ISBN 9780073337234. Russell, P. J., et al. 2010. Biology: Exploring the Diversity of Life. Toronto: Nelson Education. ISBN 9780176440947. This page was last modified on 4 July 2013, at 19:13.